Deep Wave is a very curly, deep wave. This hair is 18-19 inches in its curly state and 20-22 inches when pulled straight. 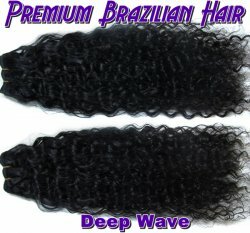 All of our Virgin Brazilian hair has a natural texture. Since it isnt processed for teture or wave pattern no two bundles are exactly the same. We have have sorted and grouped the hair into different wave categories to ensure that if you purchase more than one you will recieve bundles of hair that will blend well together.